Looking for a good project for your school, Boy Scout Troop, Summer Camp, or charity racing event? The proud builders of the lovely modern-style North Canoe shown above are embarking on their maiden voyage. They built this sleek craft under the direction of Travis Jones, over a period of only a few weeks. The handsome traditional-style North Canoe shown above was built by Peter Tamlin and his students at the I. E. Weldon Secondary School in Lindsay, Ontario. Both of these canoes are John Winters designs, built with Green Valley Boat Works plans. The traditional canoe above is also featured in Ted Moores' latest 2016 edition of Canoecraft, a book which is a must for all aspiring canoe builders. 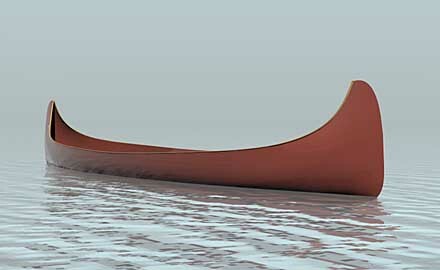 The North Canoe plans are offered in both Recreational and a Racing versons. The Recreational version (below left) can be built in either the traditional Voyageur style with the high ends, or in a Modern style with low ends (as in the photo above). Either style can be built in any length from 25 to 28 feet. 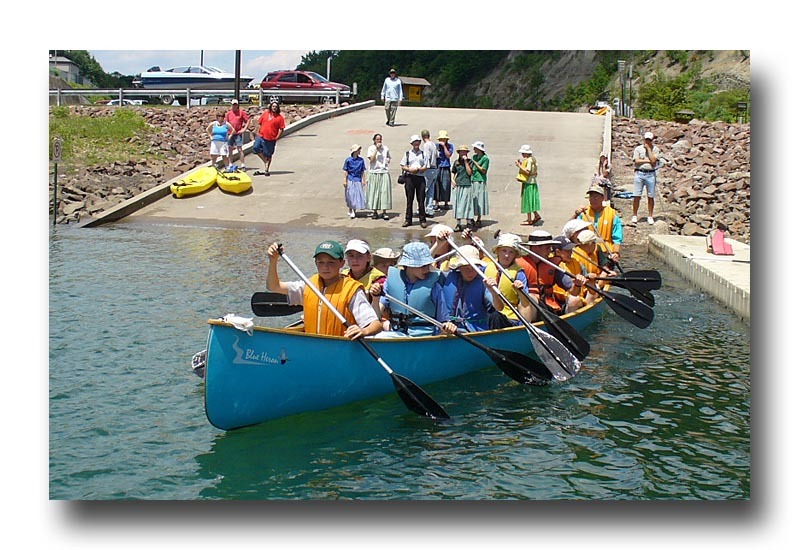 At 25' these canoes have a designed displacement of 1,400 lbs. They can be configured for 6 to 10 paddlers, depending on their weight and size. The Recreational versions are a symmetrical design, and the plans consist of half-stations from the end to midships, on 12" centers. The 28' Racing North Canoe is a very modern design with an asymmetric hull, and is designed for pure speed! But, you'd better be prepared for the other competitors' noses to get out of joint when you breeze by them in this record-setting design! 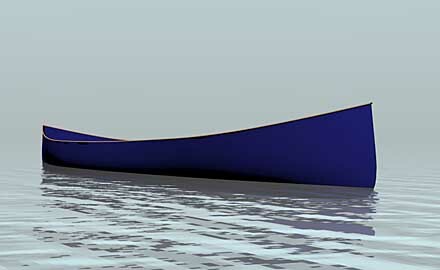 It features a much narrower beam and low ends, as shown in the rendering below right. These canoes can be built with the same materials and methods as our smaller canoes, but for long-term durability, we would consider using 3/8" thick strips and 8 oz fiberglass cloth. 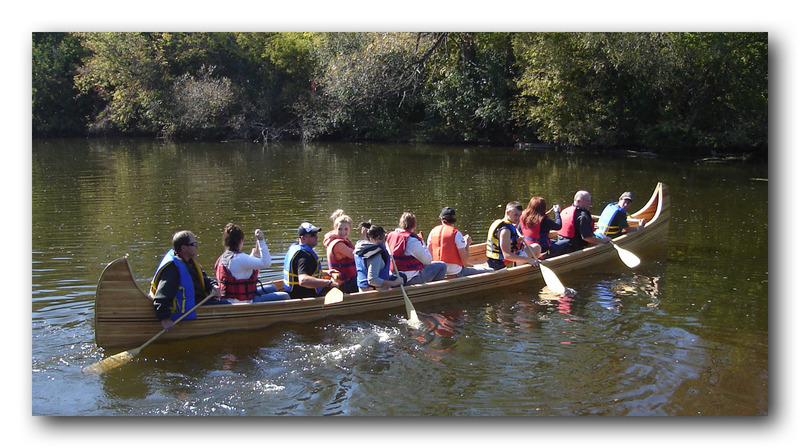 North Canoe plans are ONLY offered in electronic format, on CD-R or by e-mail. The entire set of plans requires the builder to have only two drawing sheets printed, or three sheets for the Racing version, with each sheet measuring 36" x 48" (E-size). Bow Height 42" 32.5" 29.1"
Stern Height 42" 32.5" 27.75"
Midships Depth 16.25" 16.25" 18"
Freeboard @1400 lbs 8" 8" 10"
Rocker Forward 3.75" 3.75" 3"
Rocker Aft 3.75" 3.75" 1.15"